Better late than never. Click here for Part 1. Since I overestimated by ability to keep the swatch size the same, I'm normalizing the height and width measurements by using square inches instead. So, I'll get the amount of yarn used per square inch. Easier that way anyway. My gauges didn't come out the same either, though not very far off. Again, since I'm using gauge to calculate the stitch width and height to get me the dimension of the stitch in square inches (I know, it's weird, but it lets me do the amount comparison) in order to get amount used per stitch, the gauge isn't a problem. I was hoping for a more direct comparison, but oh well. I did do the garter stitch and double crochet swatches (which is why it took me so long). Also, to state, I'm doing everything in inches. Not standard, but that's what I did because I'm a stupid American who just realized her tape measure has centimeters on it. Measurements are to 1/16 of an inch. Amount of yarn used per stitch = [amount of yarn used per square inch] / [the number of stitches in a square inch] (which is 1/[size of a stitch in square inches]). Hm. There's a relationship here. If you order the stitches from least to most yarn used, it shows that you can go to the next stitch, and the only thing you need to do is increase the needle/hook diameter to the next up size and you'll use around the same amount of yarn. And the stitch order staggers between knitting and crochet. This itself is a nail in the coffin for the whole '3 times more yarn' myth. I wonder if this trend holds out if you added more diameter sizes. I really don't want to make up more swatches to find out, though. Using the same order of stitches as the second table above, I created one with the stitches size in square inches. So, yes, the knitting stitches take less yarn. They also cover less area, which is what I figured. But this still doesn't settle why, when you look at square inches and not stitches, the order changes. 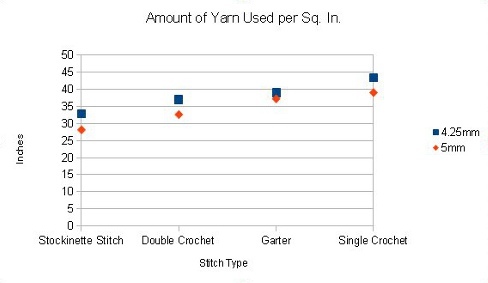 My guess is that the ratio of the area gained in the square inch to the amount of yarn used is not the same for each stitch, and that it would work out to be that the stitch that used the least yarn while covering the most area would be the one to use the least amount of yarn in a square inch. I don't feel like doing that comparison. It's not that important to this myth. Table is read down, then across (so pick a stitch on the left hand side, then find the stitch to compare it to at the top, then find where they meet to find the percentage more of yarn the first took against the other. If it's negative, it took less. None of these are anywhere close to 3 times the amount. There's one more thing I do want to explore here, though. Those saying that 'crochet takes more yarn' could claim is that, in reality, if a knitter and a crocheter were doing similar projects, they would pick completely different tool sizes. And, most likely, the knitter would use a bigger tool than the crocheter (my guess based on my experience...if you can prove me wrong, let me know). This is what I was trying to test with the 'same gauge' thing. The problem is that the gauges aren't all that compatible between knitting and crocheting. Should have known that. However, the data I do have shows that this argument doesn't work either. Look at the first table again. 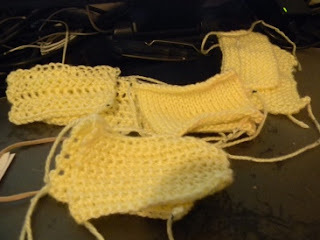 If, say, a knitter wanted to crochet something that would normally be in garter stitch and still use a similar amount of yarn, just change it to double crochet. Going from garter to double crochet results in less yarn being used, and if you go down a tool size or two (which you would), it'll use close to the same amount of yarn. Once again, it comes down to what you're doing in that craft. The knitter could use less yarn and therefore get more out of the same yardage, but the crocheter could do so too. Therefore...myth BUSTED. Crocheters aren't using up all your yarn. 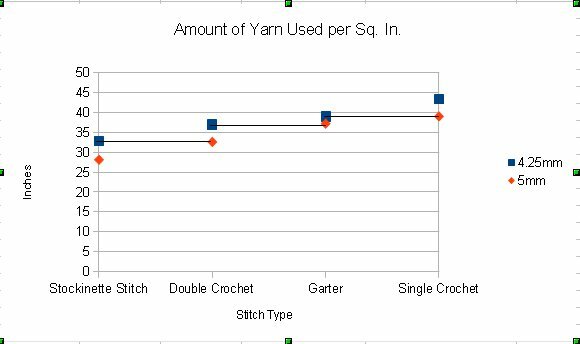 Actually, you may be using more yarn than a crocheter, since it all depends on stitch and tool size chosen. 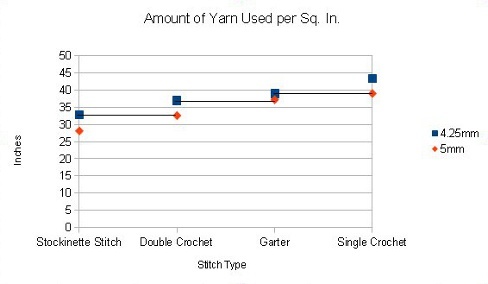 And even if the crocheter is using more yarn, they're NOT using anywhere close to 3 times as much. So stop repeating this myth. Wow. Thank you so much for going to all the effort to work this out! I've always wondered, because I'm a broke student so I'm always trying to save yarn. Now I know how to be economical with stitch type and needle size! This is really awesome info! Wow! thanks for this info.i've always believe that crochet uses more yarn than knitting. Thank you for your hard work and your generosity and kindness for sharing this with those of us whose mind is to cluttered to figure this out. I will be sharing this with others and spreading the words, "Myth debunked!" Hm...maybe. Wouldn't be the first time I made a stupid mistake like that. I would have to dig up the spreadsheet though to check; it's been awhile since I did this! The good news is if everything's off by a factor of 100, then the comparison's at least stand, even if the raw numbers are screwed up. Thanks for pointing it out though; just haven't managed to revisit it. No longer interested. Unsubscribe me.